1) Stand with feet shoulder-width apart, toes sticking to the ground. Slightly bend knees and hang arms naturally by sides of body with elbows also slightly bent, palms facing backward, fingers apart and thumbs pointing to trouser seams. Relax shoulder, elbow, wrist, and finger joints. Hold head and neck erect, with chin slightly drawn inward and tongue against upper jaw. 2) Stand upright and consciously straighten Dumai (a Chinese medicinal term which denotes the line running from the perineum up through the spine to the top of the head) Slightly lean torso forward but neither protrude nor withdraw chest or waist. Slightly pull in buttocks and keep weight to front of sole. 3) Look 45 degrees downward to the ground. This is designed for the training of internal breathing skills and inner strength so as to activate the internal organs, work up the internal vitality and increase the steadiness of the lower limbs. 1) With stillness as the principal requirement for this movement, try to realize motion through stillness. Up to a certain point of the training of this Zhuanggong and with the increase of the level of stillness, unexpected body responses will be experienced by the practitioner. This is a reflection of the activation of the internal breathing and should not be worried about. Instead, the practitioner should go on with the practice. 2) When you lean slightly forward, keep entire body relaxed except for the sticking of toes to the ground and the slight pulling in of coccyx. These two parts of body must not be relaxed during the entire practice lest your vitality is lost. practitioner; objects with red and yellow color are forbidden to avoid possible distraction of attention and failure of practice. 4) Natural breathing is required but breath should be controlled, so to speak, at the Laogong (on the palm), Dantian (on the lower abdomen) and Yongquan (on the sole) acupoints. (Beginners may practice how to control his breath at each of the acupoints in the above order for two months before he begins to practice, half a year later, how to control his breath at all three acupoints at the same time. 5) When absolute stillness is reached, the practitioner begins to move, despite of himself, every part of his body in a natural manner. But violent movements should be brought under control. 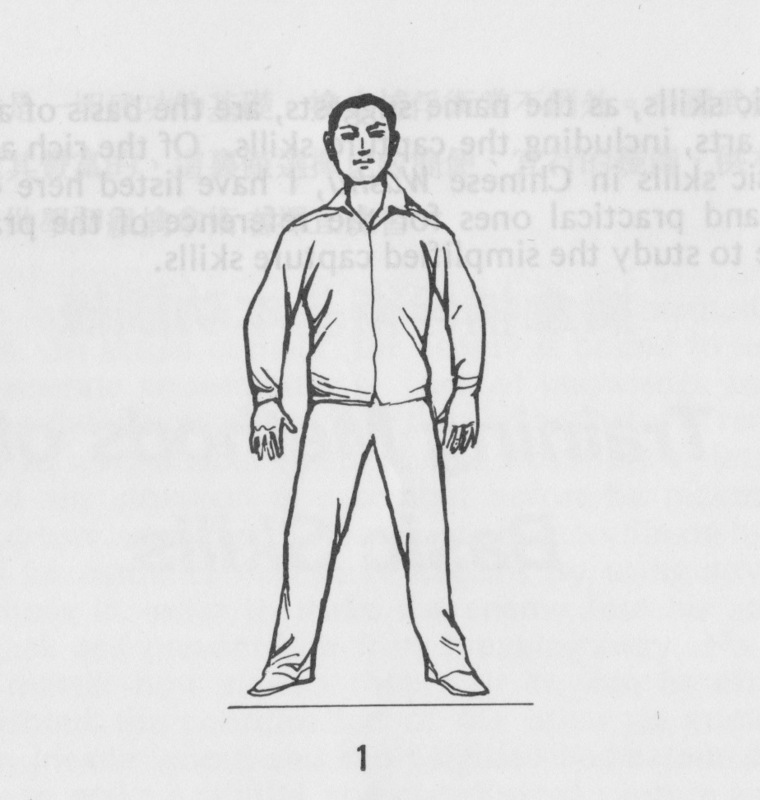 the same author), which bases its Wugong (martial skills) on Qigong. The time used for the practice of Hun be yuanzhuang may 10 to 15 minutes for beginners and it is gradually increased to one hour. Highly skilled practitioners may extend the time up to two hours. I reach the acme of the Hunyuanzhuang skill.